Trainer Kris Lees is confident his classy three-year-olds Gem Song and Graff can shape up in respective races at Rosehill Gardens tomorrow. Gem Song (Jason Collett, $8 on TAB fixed odds) is back after an interrupted campaign to run against his own age in the Listed Darby Munro Stakes (1200m), and Graff (Brenton Avdulla, $5 equal favorite) takes on older sprinters, seeking a Group 1 breakthrough in the $700,000 The Galaxy (1100m). 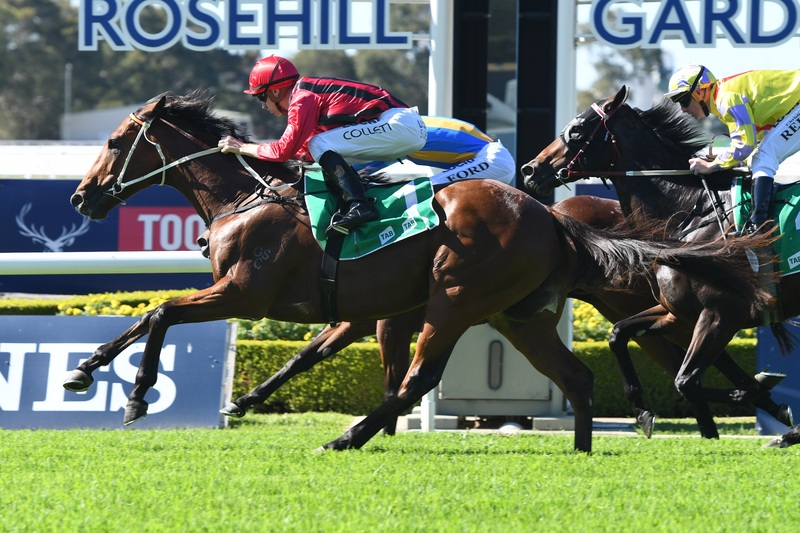 Gem Song looked set for a successful autumn campaign when first-up he overcame racing on the inferior inside section in the straight to win the Group 3 Eskimo Prince Stakes (1200m) at Warwick Farm on February 9 on soft ground. That took his record to four wins from only six starts (he has never missed a place), but a skin infection forced him out of the subsequent Hobartville Stakes (1400m) and Randwick Guineas (1600m). Gem Song, whose sire Your Song relished the wet, showed he was ready to resume his campaign with an impressive 845m Wyong barrier trial second on March 12. Gem Song’s clash with boom three-year-old Classique Legend ($1.90 fav), unbeaten from two starts in easier grade, will be one of the highlights on an outstanding program. Graff is back from Melbourne following excellent Group 1 fourths in the Black Caviar Lightning (1000m) and VRC Newmarket Handicap (1200m) at Flemington on February 16 and March 9 respectively, and his trainer says “I couldn’t be happier with him”. “He is going to get his chance for a Group 1 breakthrough from a soft draw and with only 52kg,” Lees said. Graff is in receipt of 7.5kg from topweight Redzel ($5 eq fav, and meets him 2kg better than when he finished fifth to him in The Everest (1200m) at Royal Randwick last October. Nonetheless, Lees considers accomplished wet tracker Redzel is still well enough treated with 59.5kg, considering his outstanding record. Provided Graff races up to expectations in The Galaxy, he will join stablemate and last year’s Galaxy winner In Her Time in the $2.5m Group 1 TJ Smith Stakes (1200m) at Randwick on April 6. Lees also is confident Big Duke (Avdulla, $9.50) will run well in the Group 3 Manion Cup (2400m) on his way to the $2m Group 1 Sydney Cup (3200m) at Randwick on April 13. Lees also runs veteran Doukhan (Collett, $34), who has been improved by one run this time in and also is at his best on soft and heavy ground. Last year’s Provincial Championships Final winner Serene Miss (Collett, $12), Star Reflection (Avdulla, $17) and Miss Que (Corey Brown, $14) represent the stable in the Group 3 Birthday Card Stakes (1200m), and all have chances in an open contest. Karavali (Collett, $16) and Marcellina (Brown, $61) round out the stable’s runners in the Group 3 Epona Stakes (1900m). Lees does not have a runner in the $3.5m Group 1 Golden Slipper Stakes (1200m) but will take a keen interest in the performance of pre-post favorite Cosmic Force ($4.60). The Deep Field youngster was bred by one of Lees Racing’s long-standing clients Bob Hannon, who retained a small interest in the colt when sold and stands to collect a $1m Inglis bonus if he wins. Lees trained Cosmic Force’s dam Little Zeta, a Commands mare who won a 900m Maiden at Broadmeadow on debut exactly 11 years ago today. Little Zeta was unplaced in four subsequent starts, and retired. Cosmic Force is her seventh foal. Lees also prepared Little Zeta’s second foal Onemorezeta (by Onemorenomore), whose three wins included the Group 3 Red Roses (1100m) at the 2014 Melbourne Cup carnival at Flemington. She was also runner-up to stablemate Danish Twist in the Group 3 Dark Jewel Classic (1400m) at the 2016 Scone Cup carnival.